Done! The Yankees secured the WC home field advantage last night in the opener at Fenway. Whew. I was worried about them having to fly out to Oakland, but now they’ll play the winner-take-all contest on Wednesday night at 8pm ET in the comfy confines of the Stadium with its even comfier short porch in right field. What’s more, they hit enough homers last night – including Judge’s first after his too-long stint on the DL – to set a record for homers in a single season. Hoorah. Hitting them against the Red Sox last night only made the Janer – yes, they scored 11 runs – that much sweeter. But now the nerves set in. Wednesday night will be a pressure cooker. Who will pitch? I vote for Happ to start. Severino is my second choice and Tanaka is third. I think Happ has been the most consistent of the three, last night’s grand slam to Pearce notwithstanding. I just hope the relievers will bring their A game. 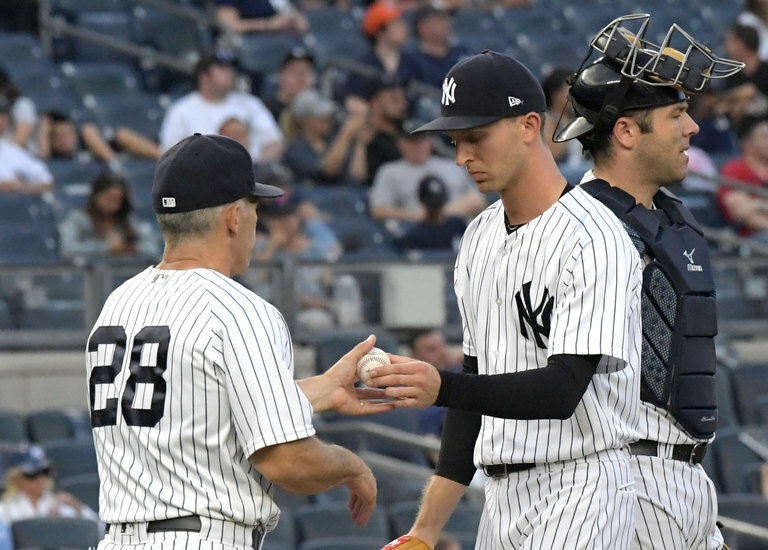 I’m not happy that Sanchez and his tendency to allow passed balls will be catching, but I guess if he brings a hot bat it’ll be OK. Didi seemed to manage his wrist brace well enough last night, but between now and Wednesday everybody needs to stay healthy. Boone will rest the starting players and use subs this weekend, which will help. But personally, if somebody’s hot I think he should keep playing to maintain the momentum and not get rusty. The Yankees tried to sweep the Red Sox and avoid letting them clinch the AL East on our soil, but they couldn’t manage a win in the finale. So be it. There were some positives to take away from this series. Severino pitched well – better than he has in ages. Happ continues to dominate the Red Sox and provide an overall consistent arm in the rotation. Luke Voit continues to mash and infuse the team with tons of energy, making Bird a distant memory. Andujar may have his shortcomings on defense, but he can hit, really hit. Stanton’s grand slam last night broke him out of his slump. And, of course, Judge is back in the lineup; he may not have found his stroke yet, but he’s getting there. On the negative side, Gary Sanchez. Period. Please can we trade him? What good is he to this team? If he were hitting a ton, I’d say OK, maybe he can DH now and then. But he hasn’t hit for real, not in a long time. And his defense is atrocious. As Kaat said last night on MLB Network, pitchers don’t want to throw to a guy they can’t trust and Boone would be well served to use Romine in a one-game playoff. Another negative? Tanaka. I would not use him to start a one-game playoff at Yankee Stadium. He gives up too many early runs. The shaky bullpen. Honestly, every time Betances takes the mound, I worry. Ditto: Chad Green. Chapman is back but let’s see how he does after the layoff. And Sheffield may or may not play a role in important situations. With the A’s freaky 21-run win over the Angels yesterday, we’re only a whisper in front of them in the WC standings. This thing could go down to the wire. I’ll be at the Monday night game when they open the series against the Rays – Section 1, Row Q at the Trop. I’ll try to will them to victory, but this race is on them. Yes, we won the series against the Orioles. Yes, Didi was an absolute stud. Yes, Judge hit more homers. But we lost yesterday’s finale and the Red Sox lost their game to the Rays, so guess what? We’re still 3 1/2 games back! It’s enough to make a person crazy. When will we ever gain ground? When will that perfect combination of our wins and their losses amount to anything? Will we overtake them as the division leaders or not? Our series (weather permitting) over the next few days against the Twins would have been a relief in the good old days when we owned them. Not anymore. They’re contenders too, and they’re hungry. They want that Wild Card spot. Girardi switched the rotation around, so Jaime Garcia could pitch against them tonight. I really hope he and Joe have worked through their little spat after Garcia was pulled early. I also hope he has the inside track against his former team and can pitch his heart out. Are the Yankees ever going to push the Red Sox out of the division lead? We win, we lose, we win, we lose. We won the series against the Rays with today’s “W,” but no matter what we do, we’re still 3 1/2 games back in the standings. It’s frustrating! The good news is we’ve pulled ahead of the Twins for the Wild Card, so that’s something. But I’d still love to take the AL East. I’d also like to see Judge, Sanchez, Holliday (so glad he’s back), Castro, Didi and the rest of the gang get hits, hits and more hits. No more of these one or two-runs a game. Poor Sonny Gray gets no run support. I want runs, I tell you. Janer after Janer. And I want pitching – from the starters as well as the relievers. Robertson had a great game the other night and Chapman seems nearly back to his old self. Girardi has had a quick hook with CC and Garcia, and I don’t blame him; these are all must-win games from here on. Not much else to say except it’s crunch time. I can’t believe we’re in mid-September already, but the leaves on the trees here in CT don’t lie. So let’s go, Yankees. For real. Just having a little fun with the name, but did the Yankees ever miss the bat of Matt Holliday. He came back not a moment too soon – contributing mightily to the crucial series win over the Red Sox. Now we have a true DH or even a first baseman, if necessary. Chase Headley’s hot streak at the plate also comes at the perfect time. And how about Severino’s pitching in this series? Inning for inning, he bested the great and powerful Chris Sale. Good for him and good for the Yanks. CC is showing what a crafty pitcher he’s become too. His spat with Nunez over the bunt on Friday night was comical – as was Jim Rice’s retort to him – but it doesn’t matter now since we won’t play the Sox again (thankfully). I was happy for Judge’s homer last night, but he really has fizzled out. Which is, again, why Holliday’s offense is so important. Too bad Hicks is now gone with an oblique strain. He had cooled off lately, but he’s had his share of injuries this season. So now? We have the always-difficult Orioles to deal with. I hope there’s no letdown and the Yanks keep playing great baseball. I want the division, not the Wild Card! The race for the second American League wild-card berth has been a slog of the mediocre. Teams get hot, then fade, but never really fade away. At the start of play on Wednesday, six teams clustered on the edge of that spot, like a pack of wounded and wailing dogs just outside the playoff door. For months, the Yankees have tuned out the noise. But the incessant scratching is growing louder, and the Yankees cannot escape it. They have not clambered up the stairs to a loftier perch in the standings. Maybe such a journey is beyond them. After falling twice to the Cleveland Indians in the Bronx on Wednesday, the Yankees are 70-62, losing their grip on the top spot and the chance to host the wild card game for the second time in three years. Since June 13 — for more than 11 weeks, that is — their record is 32-39. As the Boston Red Sox arrive for a four-game weekend series starting Thursday, the Yankees still must prove they are up for the fight. Even Manager Joe Girardi, who specializes in the art of the qualified response, acknowledged the importance of this weekend. The Red Sox lead the division by five and a half games after a three-game sweep in Toronto. True enough, but only in a last-chance kind of way. The Yankees are much closer to the gang behind them than to the Red Sox above them, which means next week’s series in Baltimore could matter more. The Orioles (68-65) have won seven games in a row and finally have their best hitter (Manny Machado) and elite closer (Zach Britton) healthy and performing well. The Minnesota Twins own the second wild card now, and the Yankees host them Sept. 18 to 20, right after another series with the Orioles. Who knows how the standings will look then, but the Los Angeles Angels, the Kansas City Royals, the Texas Rangers, the Seattle Mariners and the Tampa Bay Rays also have hope. The Yankees had not been swept at home all season, though there is no shame in losing to Cleveland. As the Indians defend their A.L. crown, they are a season-high 20 games above .500, even with five important players on the disabled list: outfielders Michael Brantley and Lonnie Chisenhall, second baseman Jason Kipnis, starter Danny Salazar and the relief ace Andrew Miller. Yet the Yankees could hardly muster a fight on Wednesday. In the opener, they got four walks, a wild pitch and a hit batter from Indians starter Trevor Bauer, but managed just one run. They looked helpless against Bryan Shaw and Cody Allen, who baited Aaron Judge — in a pinch-hitting role — with five curveballs before blowing a high fastball past him to end the game. The final score, 2-1, made the Indians’ first run stand out, as it came on a passed ball by catcher Gary Sanchez. Starter Jaime Garcia gamely blamed himself for the tricky movement on his pitches, and for giving up hits. But Sanchez’s defensive adventures have become a persistent, discouraging theme. So has Judge’s disappearance in the second half. He started the second game of the doubleheader — his first start of the series — but could not do much to prevent a 9-4 thrashing. He reached on an infield single and scored, then struck out, walked and flied to right. Judge is hitting .181 since the All-Star Game, roughly the same average of his confounding cameo at the end of last season, when his tantalizing power was often hidden under an avalanche of strikeouts. By spending the first half of this season as the best hitter in the A.L., Judge carried the Yankees. Now he is lost again, like Matt Holliday, whose second half has produced a .136 average, one home run and one lingering back injury. The Yankees also missed Starlin Castro for most of two months until he returned from a hamstring strain last week. The Yankees have a sturdy enough rotation, with C. C. Sabathia, Sonny Gray, Masahiro Tanaka and Luis Severino lined up against the Red Sox this weekend. General Manager Brian Cashman, meanwhile, is in Japan to scout Shohei Otani, a two-way sensation who could arrive in the majors next season. The pursuit of Otani, 23, fits with the long-term vision Cashman explained last summer after trading Miller for prospects. The goal, he said, was not to simply prop up a roster in hope of squeezing into the playoffs. “The one thing the Yankees have always stood for, and do stand for, is the effort to try to become a superteam,” Cashman said. They were never going to achieve that in one season, despite the giddy illusion of April and May. The Yankees are on the right path, but building and sustaining a superteam takes patience, and the Yankees are not there yet. Even a sweep this weekend would leave them behind Boston. Of course, the Yankees might still have their wild-card spot by the end of the series — but then again, they might not. They have time to pull away from the middle, but for now, the middle is where they belong. That is what their summer has revealed. I was never a fan of Chapman’s. He throws hard, but he seemed like trouble, and I much preferred having Andrew Miller back if that were possible. But here we are. Chapman is blowing saves. He’s not the same guy we had the first time around. Whether the problem was Joe Maddon, who rode Chapman too hard in last season’s World Series, or a rough patch or simply the fact that no matter how hard you throw the baseball, you still have to learn how to pitch. Remember Kyle Farnsworth? Last night’s loss to the Red Sox in the series finale wasn’t the fault of the offense for once. I defy anyone to hit Chris Sale, and the Yankees did a decent job of trying. No, this one was on Chapman. So now we sit 5 1/2 games back about to face the Mets, then the Sox again. Where does this team go? Someone on Facebook suggested Aaron Judge was another Dave Kingman and I vehemently disputed that. But is he? Or will we see the Judge of early in the season? Thank God Hicks is back. Boy, did I miss him. Having Starlin Castro back would help too. Ditto: Matt Holliday. But mostly it’s our rotation and those injuries that are so disturbing. First CC, then Tanaka, never mind Pineda. It’s one big question mark whether Luis Cessa is the guy to fill in. At this point, I’d rather have Nick Swisher.